Overview - David M. Rosenthal's backwoods thriller starts with a bang: a single shot, aimed at a lone deer, that hits and kills a young woman. 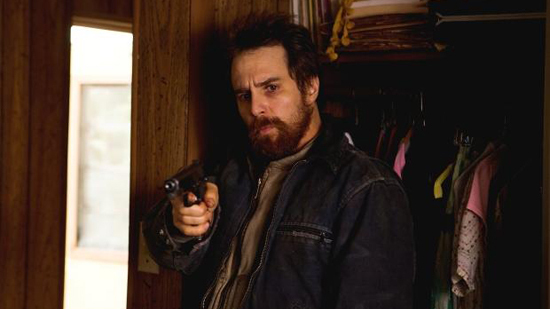 The hunter, John Moon (Sam Rockwell), watches her die before discovering a box of money near her body. In a desperate panic, he takes the cash - hiring a low-rent lawyer (William H. Macy) to fight his wife's (Kelly Reilly) divorce suit - and attempts to cover up the killing. But when he discovers that the money belonged to a group of hardened criminals, the hunter becomes the hunted in this tense cat-and-mouse struggle in the backwoods of West Virginia. Fatal accidents, poor decision making, and bags full of stolen money are all tried-and-true staples of the crime thriller genre -- and while many movies might start with some variation of that simple premise, it's often the smaller details and deeper themes that end up separating the successes from the duds. Steeped in southern gothic dread and dark noir sensibilities, 'A Single Shot' makes a valiant attempt to be one of those successes, arming itself with an impressive cast, solid direction, and a few thought provoking emotional beats. Though it sadly never quite hits the mark, it's also far from a true misfire, becoming a slowly escalating cinematic bullet that ends up trailing off just a little too far into the bushes. Set in a secluded Appalachian mountain town, the story focuses on a lonely hunter, John Moon (Sam Rockwell), who is struggling to save his dissolving marriage so that he can reunite with his wife and child. 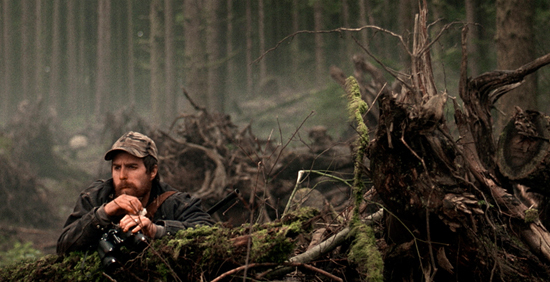 After a terrible accident occurs during a hunting trip, Moon stumbles upon a large sum of money. Down-on-his-luck and desperate, he takes the cash, hoping it will help him rebuild his life. But as the consequences of his actions spiral out of control, Moon soon finds himself the target of deadly criminals who will stop at nothing to get back their stolen loot. Immediately echoing similar stories like 'No Country for Old Men' and 'A Simple Plan,' the narrative can't help but feel very familiar, and these common plot threads do initially make it hard for the film to carve an identity of its own. To this end, the first half does come across as a bit generic and the pacing is on the slow slide. Attempts at tension also fall flat here and there and certain story beats could have used more development and focus. In fact, there were times when the movie's borderline dragging tempo started to remind me of another recent "thriller" called 'Tomorrow You're Gone,' and I wasn't exactly surprised to discover that the two films actually share the same writer. Thankfully, however, unlike that dull and nearly comatose misfire, 'A Single Shot' eventually does find an engaging rhythm and director David M. Rosenthal does a great job of creating an appropriately isolated and somber mood without overwhelming the audience with gloom. Instead, his bleak images and methodical editing perfectly complement the film's noir influenced gothic tone. Likewise, the movie's dialogue and visuals have a strong sense of authenticity, helping to fully evoke the unique isolated mountain town setting. With an odd collection of seedy lowlifes and wounded outcasts, the impressive ensemble fully inhabit their characters. William H. Macy is memorable as a strange local lawyer with ambiguous allegiances, and Jason Isaacs and Joe Anderson are both strong as the film's menacing antagonists (though their parts are underdeveloped). Special note should also go to Ophelia Lovibond whose bright and spirited performance as Abbie offers a welcome break from the movie's otherwise depressing atmosphere. Helping to add to that depression, however, is Jeffery Wright, who turns in a truly stand out performance as Moon's drunk friend Simon. With constantly mumbled speech and heavy eyes full of barely hidden pain, his final scene is one of the film's most powerful -- that is, if you can actually understand whatever the hell it is he's trying to say. But as impressive as the entire cast is, this is really Sam Rockwell's show, and the versatile actor does a fantastic job. Though he's great at playing funny and sarcastic smartasses, here he goes in the complete opposite direction, inhabiting a quiet, emotionally burdened, and at times quite pathetic character. But while Moon might at first seem weak and incapable, the man continually proves otherwise, revealing new layers of resourcefulness and skill as the runtime goes on. The more we learn about John Moon through his on-screen actions and choices, the more interesting the film becomes, slowly engaging the audience in the man's escalating drama and internal struggles. The plotting is still rather predictable and familiar, but the execution of the script is ultimately worthwhile and the story tackles some powerful themes dealing with guilt, regret, and consequences -- which all come to a head in a fittingly ironic and tragic (but perhaps a bit too on the nose) ending. If you're a fan of similar noir-influenced, slow-burn thrillers, then 'A Single Shot' will likely offer a worthwhile jolt, but it's blast doesn't quite leave the impact that other better efforts in the genre pack. Well Go USA brings 'A Single Shot' to Blu-ray on a single BD-25 disc housed in a keepcase with a cardboard slipcover. After some fast forwardable (but not skippable trailers) the screen transitions to a standard menu. The packaging indicates the release is region A coded. The film is presented in a 1080p AVC/MPEG-4 transfer in the 2.35:1 aspect ratio. Marked by an appropriately dreary style, this is a solid transfer that is only held back slight by some sporadic artifacts. Shot on 35mm, the source is in great shape (as one would expect from a new release) with a light to moderate layer of grain. With that said, there are times when digital noise does creep in as well (particularly in dark scenes) giving some shots a faintly compressed quality. Likewise, some minor false contouring is also visible from time to time. Clarity is good throughout, though the image does veer toward a softer look and dimension is a little lacking. The color palette sticks to an intentionally drab and cool aesthetic with lots of blues and grays. Contrast is nicely balanced and shadow detail is good, though blacks can look a bit blue in some scenes. While noise and other artifacts do creep in every now and then, 'A Single Shot' comes to Blu-ray with a mostly fitting transfer that preserves the film's somber visual style. The movie is provided with an English DTS-HD MA 5.1 track and a Dolby Digital 2.0 track along with optional English SDH subtitles. Delicate, spacious, and immersive this is a strong mix that helps to enhance the story's desolate tone. Dialogue is relatively clear throughout, but some of the speech is a bit soft and mumbled making it hard to understand certain lines (though, this is more of a performance quirk than a technical issue). The sound design features an impressive sense of wide atmosphere, spreading and dispersing subtle nature effects like wind, birds, and falling rain directionally around the room. Likewise, the track's dynamic range is high, giving aggressive presence to specific sounds (a ringing phone and passing train, for instance) that create a forceful break from the film's otherwise quiet ambiance. On that same note, gunshots are also appropriately powerful, creating a deep, permeating low frequency kick. Speech isn't always ideal, but the mix proves to be enveloping in both delicate and forceful ways, fully evoking the movie's tense and gradually escalating tone. Making Of (HD, 26 min) - Presented in 1080i with Dolby Digital 2.0 sound, this is a behind-the-scenes doc that offers cast and crew interviews and production footage. The participants discuss story inspirations, the source novel, the adaptation process, the film's noir style, characters, and visuals, along with lots of compliments lobbied at the great Sam Rockwell. Filled with a nice assortment of production info, this is a welcomed inclusion. Interviews (SD) - Presented in standard definition with Dolby Digital 2.0 sound, separate interviews with Sam Rockwell (23 min) and William H. Macy (7 min) are included. The actors discuss what attracted them to the project, their characters, what it was like to work with the director, and the movie's themes. There are some repeated bits from the previous supplement, but most of the material is new. Trailer (HD, 2 min) - The movie's trailer is presented in 1080p with Dolby Digital 2.0 sound. 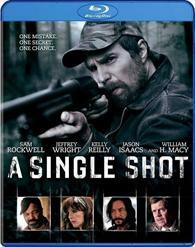 'A Single Shot' is a solid but not altogether successful crime thriller. The cast is strong, the film's dark and gloomy style is fitting, and the story's drama and deeper themes are ultimately engaging, but the narrative drags in spots and feels too familiar and underdeveloped. On the technical front, this disc comes with a decent video transfer that's only held back by some occasional artifacts, and a strong audio mix. We don't get a whole lot of extras, but the making of featurette and interviews offer some welcome insights into the production. Though it isn't as original or gripping as other similar efforts, this is still a worthwhile entry into the genre.